Watch designs and their origin can present us with answers about our consumer environment. Why is that important? It appears that consumer deception goes unchecked in our world and luxury items, like Swiss watches, abound with false tales. It's also the topic of which I know the most.In present times, consumers have slightly more than "no help" from trade organizations. Luxury goods present only a sliver of the whole. In everyday life, who keeps us safe from product fraud and deception? When you notice the price of food creeping up and your regulators tell you about a zero inflation rate, it's confusing. You can see inflation spread from just about everything from chocolate candy to heavy machinery.In such circumstances, we can use investigative reports to keep us informed. You may not have an interest in men's jewelry - that is, watches. In Asia, especially China, the industry provides important jobs. In the US small businesses income depends on knowing the truth. 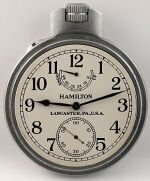 So, there you have it.In this post, I want to look at Hamilton's Naval Deck Chronometer watch from the 1941-42 era and the designs of Parnis , IWC and Panerai with power reserve indicators. Back to Hamilton's Naval Deck Chronometer. Aside from its importance in winning the war, it impacted an era of time management and activity coordination. Here's an article for reference, entitled How Hamilton Watch Co. Won World War II by William George Shuster. Evidence suggests Hamilton's World War II Deck Chronometer has inspired many contemporary watch designs. From appearances and by tracing history, so far, the Model 22 seems the earliest watch with a large second hand at the six o'clock position and a power reserve at the 12 o'clock position. Take a look at the gallery and see what you think. Some watchmakers have even created their own myths to explain their use of the Model 22 design. Let's clear this up a bit. You might find that a new matchmaking firm needed lift in their marketing. So, they sifted through registration records, discovered a defunct company and registered the name. Now, they have a claim to tradition, heritage and bloodline - and the year established. A long list of prestigious companies today did such work. What if a continuously operating firm makes up a story about its past and uses it for market position? I've seen some questionable histories that I believe came out of the brand manager's office. Aside from suspicion, research and deductive reasoning, I can name three such companies and have the records to back up my assertions. Let's look at a gallery of watches that might look suspicious. I'll comment on each below. 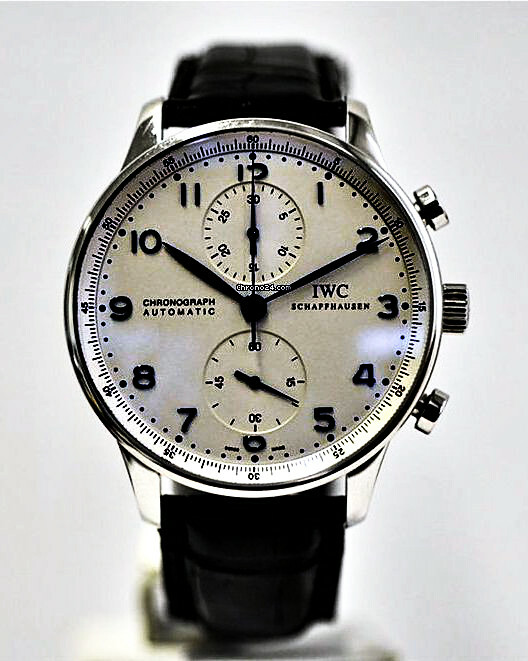 One of my favorite watch stories belongs to the IWC watch. I love this story. I'll just write some fair use information below. 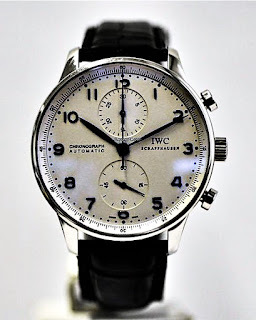 I've not done much research on IWC, except to read a few articles and study their website. Still, the name makes me chuckle. You'd have to be an American to understand the humor of it. The year he began his firm, also seems a little funny. The American Manufacturing System (AMS) didn't have the moniker. In 1868, only a couple of business used the system and they belong to the firearms industry. Few knew of the system until later in the century. While referred to as the AMS, it originated in Britain. I believe they make an excellent watch. I read articles about their use of ETA's Valjoux and Venus Venus movements. If so, what do they sell? About the Designs: Hamilton appears to have initiated the design with its Model 22 Naval deck watch. That's the image in the top left corner of the gallery. 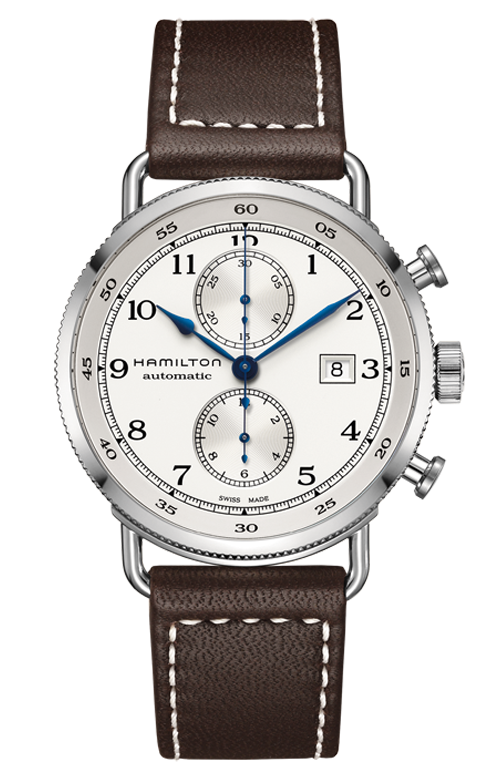 Hamilton released a revival model they called Khaki Navy Pilot Pioneer Automatik Chronograph. It's on the top row of the gallery to the left. Hamilton explained their model with this product copy. Note the reference to the 1940's. Regardless of prejudice some horologist have shown about Hamilton becoming a Swiss company, the Swatch Group, Ltd. own's its trademarks, portfolio of watches, patents and after the SSIH purchase, management. What's the difference between one holding company buying a a wholly owned subsidiary and continuing the brand. 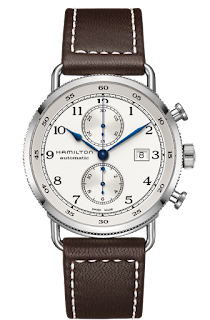 The Hamilton brand has never stopped making watches since 1892. Parnis The Parnis Chronometer (top row middle) gets a pass. They make no claims, don't have a fabricated story of tradition, heritage and bloodline. They didn't buy a defunct Swiss company.Their prices are extremely low compared to their quality. The owner filed his trademarks properly. Some other considerations: Parnis exists because western watchmakers' taught their Asian executives how to use of low-cost Chinese labor and facilities. Simply put, Parnis draws on the same economies of scale as the Swiss, Japanese and Germans. They're giving people high value products. Does Parnis copy Richemont's companies watches, especially older IWC and Panerai designs? They do to a certain extent. 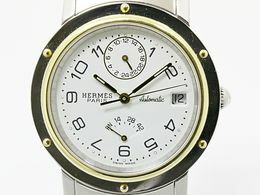 You can argue that the Parnis watch in the Gallery looks more like Hamilton's Model 22 than any of the other models. The designs may look identical, but too many differences exist to refer to Parnis watches as copies. Those differences include the size, dial and style of case. Panerai offers a 47mm model with a black dial with numerals at the 12, 3, 6 and 9 o'clock positions. 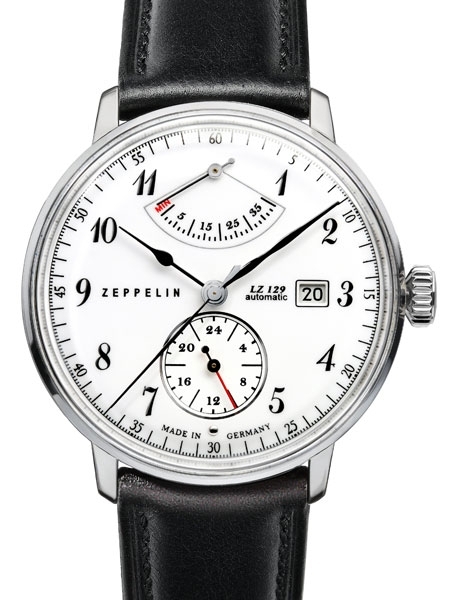 Parnis offers a similar look in a 44mm case with numerals in all 12 positions. I won't disagree about Parnis using Panerai and IWC designs. I just don't care. I don't pay a premium for tradition, heritage and bloodline (invented or not). Enough differences exist to satisfy me. Parnis gets a pass. I have no explanation for these watchmaker's use of the Hamilton designs. Perhaps, they simply copied watches other people copied and so forth. Consumers will continue to blindly buy these watches and pay premiums for advertising, celebrity endorsements, sponsorships, public relations and whatever. Consumers just don't believe they're paying for that hype. Typically, Richemont's and Swatch's companies sell their watches in boutiques they own in upper middle-class malls; they also sell through department and jewelry stores. I wrote this article (post) to alert you to what I believe companies use as gimmicks to enhance perceived value. I believe the vast majority of consumers will continue to select watches in department and jewelry stores because of the look and a sales person's charm. I can only inform, the rest is up to you. Beijing Watch Factory Wu Ji “Infinite Universe” Bi-Axial Tourbillon Watch Hands-On JAN 28, 2018 — Review by Ariel Adams Published By Coolwatchbrands Chinese watchmaking is nothing new, nor is it unsophisticated. All of this is evidenced by the 2013 Wu Ji watch by the Beijing Watch Factory. “Wu Ji” apparently translates from Mandarin to “Infinite Universe” in English, a lofty title typical of Chinese naming practices. That said, the Beijing Watch Factory should be proud. Once again they’ve broken ground for their country by producing what they claim is the most complicated watch produced on mainland China. What impresses me more is the brand itself, and their rather atypically refined sense of composure. China isn’t known for creative watch design. China is known for production, copying, and diligence – which applies to their own watch industry as well. From a production and consumption standpoint, China is the most important place in the world for watches. All but the most exclusive of Swiss watch brands rely heavily on China for the production of watch parts – such as cases and straps – even when they contain “Swiss Made” movements. Native Chinese brands are nevertheless marred by national qualities which oppose many of the qualities that allow for beautiful watchmaking. Ask the Swiss how they make watches and they use the term “slow” and “careful” a lot. China’s industrial power comes from the fact that they aren’t slow and often not careful. So why do we expect them to make good watches the Swiss way? The simple answer is that they don’t. [playlist type="video" ids="25977"] Although, these generalities aren’t rules. Not all Chinese watches exhibit confusing and awkward designs that that woefully seek to emulate European aesthetics. There are, however, excellent examples of Chinese watchmakers who emulate the Swiss rather well. This is both the strength and weakness of the Chinese watch industry. To be considered “good” by traditional standards, they need to still copy the West. To be bad, they need only to copy poorly. No matter what China is still copying, my hope at least – and there are positive signs of this – is that with China’s serious and sincere love of watches we will eventually see unique design in both the outside and inside of their domestically made watches. While there are many elements of Swiss watch design seen in the Wu Ji, it is a pleasantly original and interesting timepiece. While elements such as overall aesthetic in many of Beijing Watch Factory’s designs are inherently European, they do however take many artistic liberties in producing unique products. The Wu Ji is a glowing and ambitious example of what they can produce. Even though Chinese watch manufacturing is huge, those that can produce credible mechanical watches are still limited and few watch lovers would claim that Chinese-made mechanical movements are excellent. I am not an expert on all Chinese movements, but I do know that most of them are copies of Swiss movements. The mechanism in the Infinite Universe clearly isn’t. While an inspection of the movement makes it clear that this is a Chinese creation, I found many of the unique elements quite interesting. What I love about this watch is how the complications are much more than skin deep. What you see is only half of what you get. First and foremost, I’ll explain how you even tell the time. It would be wrong to look at this watch dial and assume you can read the time as you would on most other round-dialed watches. In fact only the upper half of the dial is used to read the time. A shortened scale for all 12 hours is placed on the top half of the dial, and both the hour and minute hand have retrograde mechanisms that have them jump back to the starting point when necessary. This makes the dial extremely confusing at first if you don’t know what you are looking at. I was playing with it to set the time and noticed the hands were jumping around wildly. “Is the watch broken?” I wondered until I realized what I was seeing. The large bi-axial tourbillon at the bottom of the dial is so tall that the watch maker decided he never wanted the hands to go over it. The double retrograde system for the hour and minute hand is designed to prevent the hands from ever accidentally touching it. The benefit is a watch with such a tourbillon system that does not require a “bubble” in the crystal. At 17.2mm thick, the watch could certainly have been thicker. The tourbillon element of the Wu Ji is quite amusing. What you have is a bi-axial tourbillon that is basically a smaller tourbillon inside of a larger tourbillon. Then you have a traditional flying tourbillon as a separate element on the dial. I’ve never before seen a watch with two different types of tourbillons on the dial. It is interesting, to say the least. The traditional tourbillon has a pleasant bird-shaped bridge which I enjoy. In addition to the tourbillons and the unique time telling system, the Wu Ji watch also contains a retrograde date indicator as well as a power reserve indicator. The manually wound movement holds just over 50 hours of power reserve. On the rear of the watch is an additional complication; a moon phase indicator, with a blue enameled disc. Claimed accuracy for the caliber TB09 movement isn’t bad. Beijing Watch Factory says the Wu Ji is accurate to about plus or minus 10 seconds a day. That isn’t quite chronometric standards, but probably in line with many Swiss tourbillons. Other Chinese movements can often be off by as much as a minute a day. So all things being considered, 10 seconds a day for this type of complex movement is pretty good. What the watch cannot escape from is China’s ubiquitous use of machine-decorated parts. Timepieces of this quality in Switzerland exhibit a high level of hands-on attention. Of course the Wu Ji was hand-assembled, but like its lower-priced brethren, it uses parts that have machine polishes. Skilled watch lovers, for example, can always spot “Chinese Geneva stripes” as oppose to the more refined Cotes de Geneve lines on Swiss watches. The Chinese watch industry has all the money and motivation to up their ante a bit when it comes to decoration, but it is possible it just isn’t in their DNA. Traditional Swiss watch making goes to great and careful lengths to ensure that movement aesthetics are perfect. They use special woods to polish metals and age-old techniques that perhaps never quite made their way over to China. The real culprit however is probably sheer time. Watch movement decoration is the most time consuming part of high-end watch making. To keep prices and production schedules reasonable, I simply don’t think that China can handle the intense slowness of the Swiss. On the wrist, the Beijing Watch Factory Wu Ji is 44mm wide and sits large thanks to its wide lugs. The case comes in either 18k rose gold or platinum. 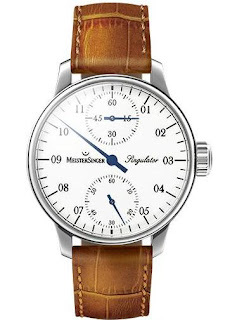 The inspiration for the design is clearly Greubel Forsey-ish, but it looks decent and I am happy that it isn’t just something simple and round. Nothing like a boring perfectly round case to destroy an otherwise unique wearing experience. The Infinite Universe is conservative, but has learned that boring isn’t the same thing. The level of uniqueness mixed with traditional looks is an art that Europeans have learned well, and the Wu Ji is the latest to replicate that. Does it succeed? It really depends on who you ask. Beijing Watch Factory has succeeded in impressing me – a lot. It has also succeeding in producing something that is both unique and interesting, but is also the type of thing that even the most snobbish watch lovers will take notice of. Complex Chinese watches are here and here to stay, and they are getting better each year. Are they alternatives to the more expensive Swiss stock? Yes, but they aren’t outright replacements. Swiss watches will probably always beat Chinese watches when it comes to sheer refinement and attention to detail. More and more I am convinced that this is caused by a fundamental difference in culture and values. It isn’t a matter of better or worse, but what goes into the production of tiny mechanical art. Having said that, the Chinese will always beat the Swiss when it comes to price. What makes the high-end Chinese watch industry unique is that they are trying to provide something that the current culture is not set up to do as well as the Europeans, and to me that is an admirable feat. In a huge way it is ironic as the Chinese are the post ardent appreciators of Swiss watch making craftsmanship. Perhaps because it is so counter to their own culture’s production values. Pride however is strong in both cultures, and brands like the Beijing Watch Factory thrive on being able to be Chinese and be the best at what they do. As it stands we will continue to watch as the Chinese develop new and interesting movements, and no longer consider them as a a mere novelty not worth the investment of real watch lover money. And an investment the Wu Ji is. Given the complexity the watch it is arguably well priced, going for between 460,000 – 520,000 Chinese Yuan. That is about $75,000 – $85,000. Inexpensive but often intriguing Chinese timepieces. I purchased this timepiece through a vendor called ‘Light in the box’. It cost less than a package of cigarettes and, provided I was willing to wait, shipped for free. I was willing to wait. The watch arrived the next month, adequately wrapped in bubble-wrap and shoved inside a plastic envelope. Light in the Box’s description is poor. 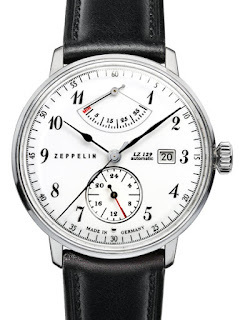 They portray this watch as semi-mechanical, quartz and automatic. There is no place to insert a battery so, obviously, this timepiece is not quartz. I examined the movement to determine what sort of mechanism was used to power the watch. The mainspring of an automatic watch is wound by taking advantage of the user’s arm movements. This motion swings a weight—the technical term is rotor—back and forth. The rotor is firmly attached to a staff which is connected to a ratcheted winding mechanism. The purpose of this mechanism is to tighten the mainspring. If you own a good automatic watch and wear it every day, the timepiece will never need to be hand wound. Normally you can hear the rotor swing when you shake an automatic watch. In this case I couldn’t. Neither could I observe the weight when I glanced through the transparent cover. This a not an automatic watch. Decent inexpensive automatic watches are available. Check out my review of the Aatos G-ThosBrBrBr or the Jaragar JJS008 for further information. Winner is a division of the Guangzhou Ruixue Watch Company Limited. (Forsining watch company limited). 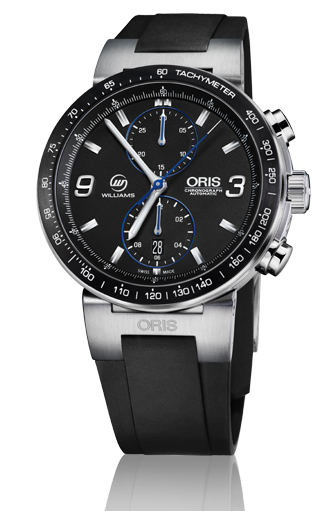 Their manufacturing plant is located in GuangZhou China and their watches are marketed under the brand names, Forsining, Winner and Jaragar. The case is well designed; two toned and covered on each side with a transparent acrylic face. The movement can be examined from either the front or the back, ensuring an excellent view of the inner workings of the watch. The hands are coated with luminous paint which provides illumination throughout short periods of darkness. The dial is nicely engraved and the numbers used to indicate the time are composed of Roman numerals. I wore this watch for a day to check for comfort and to assure myself that the time could be quickly and easily ascertained despite the busy background. Then I stored in on a shelf for two weeks, winding it twice daily. At the end of this period I set it to my computer clock and tested the unit for three days. At the end of its test cycle I found that the watch had lost one minute. This is a reasonable result considering the cost of this timepiece. You keep this thing wound and it will look after you. I did not disassemble this watch but the movement does appear to be jeweled. Although I could easily adjust the time I noticed an inordinate amount of play in the crown whilst doing so. The strap is composed of Polyurethane which looks like leather but lacks durability. This watch is intended as a gift so I did not subject it to shock and water resistance tests. 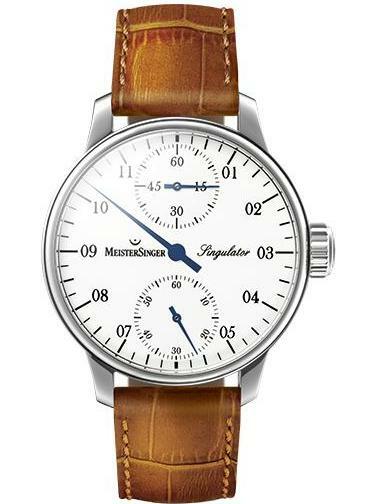 This Winner mechanical watch has a lot going for it. The price is right; the timepiece keeps good time and is visually appealing. It is comfortable on the wrist. The large crown ensures the watch can be easily wound and, because of the ‘see through’ design, this timepiece will attract attention. The hands and dial of this watch are both colored gold. While visually appealing, it is difficulty to determine the time at a glance. This watch has worked well throughout the short period I have owned it. Having said this, I do not expect it to anywhere near as durable as my much more expensive Seiko. This Winner should not be your serious everyday timepiece. It’s a cool watch though; one that will be fun to show off during the weekends. Recommended for casual use. I've owned this watch for at year. The band shows wear and, if I'd been wearing this timepiece consistently, would have required replacement by now. Accuracy is unchanged, the watch looks good and it is still a pleasure to wear. Let’s start with Sea-gull that was mentioned by many others. They are like the ETA for Swiss watches. 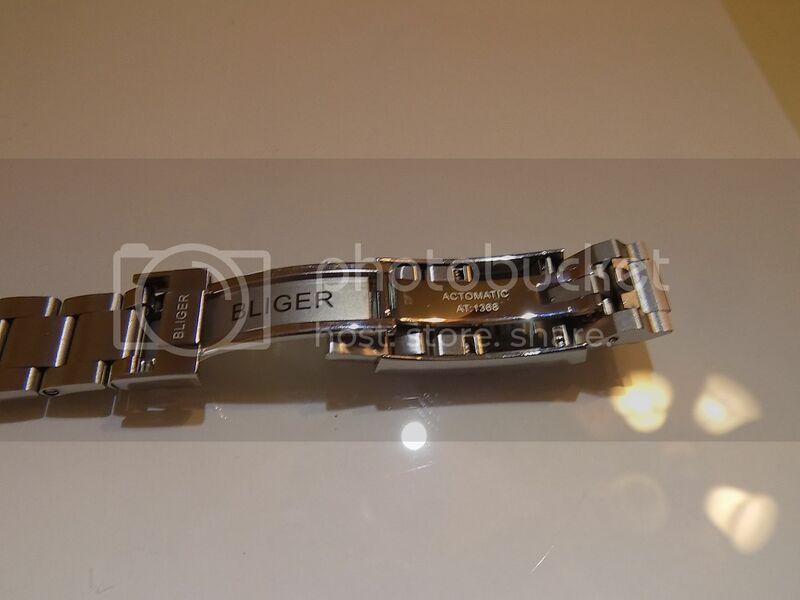 They manufacture and sell about a quarter of all the watch movements sold world-wide. They have some pretty good and reliable movements, many that are copies of Swiss ones. They also sell watches under their own brand. One watch that caught my attention is a beautiful homage to NOMOS watches, sold under the brand name of RODINA. It features a sea-gull movement and I think it is also manufactured by them. The Rodina brand is also featured at the Sea-gull gamma. Then I would mention Beijing Watches Factory. They are one of, if not the oldest and most reputable watchmakers in China. They produce only mechanical movements as far as I know and focus only on the domestic market. They can be bought from outside China only via buying services. I’ve read a lot of good things about them on dedicated forums. I personally like their watches and will buy one in the future, for sure. Shanghai watches factory, setup in 1955, also has some interesting offers. Among these offers is the Space Walk Historic Chronograph (not sure if this is the correct name) based on the in-house caliber 2992-5-F19 or 3LZF19. FIYTA can also boast themselves to be an official provider of time pieces for the Chinese Space Agency. And they also have interesting designs of their own, based on Japanese movements. CADISEN and Guanquin also offer both quartz and mechanical watches based on Japanese movements, at affordable prices. You can get a Miyota or Seiko based automatic, for under 100$ with good quality finishes and, on some models, sapphire too! PARNIS is another name well regarded by watch lovers, especially for their homage automatics (they have beautiful IWC homage watches). They offer both quartz and mechanical movements. I’m not sure if the mechanical movements are supplied by Sea-gull or not. Naviforce is a relatively young company that produces homages as well as their own designs or quartz watches. They use only Japanese movements (Miyota or Epson/Seiko). Their watches are good value for the money and cover the spectrum south of 70USD, if I’m not mistaking. Their watches are on the large side, starting from about 42mm case diameter. I recently bought for 12USD their 9044 model, an homage to a military inspired Citizen. lovely little watch to be had for 12USD. It features a Miyota 2115 movement and can also be found in a variant with a Seiko movement, albeit for ~10USD more. (That’s not the actual crown, in the picture above). I would also mention Pagani Design. They made a rather nice Tage Heurer aquaracer homage and also have quartz and automatic watches with a wide range of designs to chose from. Oh, and, I should not forget Sangdo. Their homage of the Omega Aqua Terra seems to be very well regarded. They have other models to choose from too. I’m quite sure there are others brands I did not mention, Some produce homage watches, other have their own designs. These are the ones I came across so far and managed to impress me with one or more of the watches they offer, and are also in good regard with the watch lovers. Now, one big turn off for some people is the inscription CHINA MADE on some watches. Even though the watch is on par with European or USA offerings at the price point, it seems that CHINA MADE has some sort of stigmata associated with it, like a “seal” of bad quality. I for one actually welcome the China Made inscription on a Chinese watch as a sign of honesty. I actually appreciate having that on a Chinese watch. Closing words: I actually plan to have quite a few Chinese watches in my collection, and will most likely buy, in time, a watch from almost each of the brands I mentioned. Hey Buddy!, I found this information for you: "Blog Full Content". Here is the website link: https://www.coolwatchbrands.com/blog-full-content/. Thank you.